Arjen Lucassen’s work shouldn’t need much introduction to the world of progressive rock & metal. His amazingly multi talented musical abilities are well known by most progressive fans and musicians in these days. Finally this young man has returned from his home planet called Netherlands with the next solo release in his career. It’s almost 18 years since his first solo album “Pools of Sorrow, Waves of Joy”, which didn’t get him much respect on the musical scene. Lucky for us, Arjen had time to “grow” during all these years and develop his own very unique sound of high quality both vocally and instrumentally. His previous projects are already counting 9 highly acclaimed rock operas by Ayreon and 2 releases by Star One with the latest one entitled “Victims of the Modern Age” from 2010. So the Ayreon projects were influenced by what the fans wanted to hear, though Arjen actually started the side project as a place to create music he liked. With this release he will try “please himself” and go back to his roots that influenced his musical life like Beatles, Queen, Pink Floyd and Led Zeppelin. On this album Arjen is going solo with backup from several skilled guest musicians and the star of the show must be the legendary actor Rutger Hauer from the cult sci-fi movie ‘Blade Runner’. He plays the character ‘Dr. Voight-Kampff’ and provides the listeners with narrations, written by him based on the story notes from Arjen. Besides handling most instruments, Arjen is also challenging himself by solely singing all the lead vocals. With the support by different modern techniques, I actually think he managed to improve his voice and nailed it this time. Maybe his vocals isn’t dynamic and lacking the singing range of an opera singer, but still he is able to sing with a very controlled, versatile and very characteristic voice. The total running time of this release is a massive 90:20 MINUTES movie time and 20 tunes made it to the final edition. This is a conceptual piece of art talking about serious topics by following Mr. L (Arjen) in a future world and what awaits him, with help adapting to this world by his appointed shrink “Rutger Hauer”. The storyline is written with the sense of humor I always loved Arjen for. It definitely added a big smiley on my face during the musical journey. And take a look at the artwork; it’s a reference to the comedic science fiction adventure film series “Back to the Future” franchise, which is comparable to this story. Disc one is my absolute favourite disc, beginning with one of many the highlights, the opening track ‘The New Real’. It’s introduced to us with Hauer’s narration and a mix of beautiful rhythms, melodies and a heavy industrial guitar tone. Ohhh, did I forget the flute and the nicely layered synths? Well add that as well to the melting pot. It continues with the second track ‘Pink Beatles In A Purple Zeppelin’ that is very catchy and melodic tune with humoristic lyrics. Third track ‘Parental Procreation Permit’ is another melodic song with “middle eastern” influences to the soundscape. Its gets more hectic during the end with heavy guitar tones and ending the track with a growling voice. Song number four ‘When I’m A Hundred Sixty-Four” is the shortest tune on the entire album. Its played acoustic with folk music influences blended into the harmonies. Short, but still pretty good. Another great song is ‘Dr Slumber’s Eternity Home’ with it unique use of cool banjos, synths and again a great guitar solos floating in. It’s followed up with one of my favourite songs the ‘Yellowstone Memorial Day’ telling about the battle between humankind and Mother Nature “Big Mama”. Great intro again introduced with the narration by Hauer. Drums then starts pounding with amazing melodies playing along and then the heavy guitar tunes are layered on top. 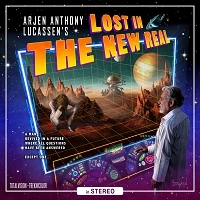 Last track on CD 1 called ‘Lost in the New Real’ is not only the longest track on the entire album, but in my opinion also a beautiful ending and closing disc one with an epic feel. It’s a perfect blend of everything I like about music. Amazing bass parts, haunting melodies with violins, flutes and some weird time signatures melded together with heavy guitar tones. It’s just pure magic. And not to forget the reprise theme from the first track ‘New Real’, which had to be included, since this is a concept album after all. Arjen uses many influences in this song from Pink Floyd, Beatles and early Queen just to name a few. Disc two is almost sounding like a “filler” album to me, including five songs that couldn’t be fitted to disc one and too important to be left out, so Arjen just added another five tracks, all covers version, more or less in the same concept as disc one. But again its two CD’s for the cost of one. What’s not to like about that right? I must admit preferring the cover versions on disc two among the rest of the ten tracks on this disc. We are blessed with the track ‘Welcome to the Machine’ a Pink Floyd cover, that in my opinion is one of the strongest songs on this entire album, with its heavy industrial guitar sound and should make the legendary Pink Floyd very proud. The Led Zeppelin cover ‘Battle Of Evermore’ is another outstanding track by Arjen. It’s able to create a very unique music experience with the beautifully innocent female backing vocals by Elvya, and her technical skills on the hammered dulcimer instrument. Let me make it clear, you must be open minded when listening to this masterpiece on the first spin and then let it spin again, again and again. It will take time to grow. Don't expect a heavy metal experience like 'Star One'. This jewel is more in the vein of Ayreon in the early years. With help from some unique talents on board, Arjen is able to deliver one of his most creative works since "Into the Electric Castle" that melds different music styles so seamlessly. The high diversity of this release includes contrasting styles such as prog, rock, metal, folk, industrial and even pop. So again be open minded and let your mind be teleported “back to the future”, and enjoy this humorous EPIC storytelling.